The Trump administration’s decision to withdraw from the Joint Comprehensive Plan of Action (JCPOA) in May has thrown a previously established, delicate geopolitical balance into disarray. The remaining signatories of the JCPOA—Britain, China, France, Germany, and Russia—are exploring options to circumvent the resumption of US sanctions on Tehran primarily by establishing a channel to allow financial transactions to cover exports from Iran. But for all parties of the JCPOA, the key Iranian commodity of interest is crude oil, particularly for Beijing. In 2017, one-third of Iran’s oil exports were sold to China—more than any other country. This relationship between the two countries softens the blow of US sanctions on Iran by giving Tehran a lifeline when facing economic hardship, to an extent. Before introducing the mechanisms that provide cover for Chinese financial transactions to take place, it is worthwhile to examine the relationship between China and Iran, which is really the relationship that China has with foreign oil. The first round of US sanctions re-imposed on August 4 already deny Iranian access to the US dollar, which is the main currency used in settling oil futures contracts—financial instruments that are the backbone of international oil trade. However, this year’s developments demonstrate that Beijing is in a bid to challenge the US dollar’s position in the global oil market. In March, the Shanghai International Energy Exchange launched crude futures contracts denominated in Chinese renminbi, also known as the yuan. As the largest oil importer in the world—with a daily purchase of around nine million barrels—China sees it as an existential necessity to reshape the global oil market, and lobby for greater usage of its currency in oil trading. There are limitations, though. It is improbable that the yuan will displace the dollar in oil trading any time soon, as few countries have signed on to settling contracts in the Chinese currency, and the renminbi’s value is tightly controlled by the Chinese government, meaning that it’s not freely convertible. Nonetheless, China wants oil, and Iran needs to sell it. The match is clear. For Iran, which has experienced 200 percent inflation in the past year and where unemployment is high, maintaining China as a client is of extreme importance. (On the flip side, Iran imports an incredible amount of goods from China, more so than from any other country.) US sanctions on Iran aren’t the only contributing factor to the country’s economic woes. Prior to the re-imposition of unilateral sanctions, Iranians took to the streets in December and January in over eighty provincial cities and towns to protest the state of the economy due to mismanagement and corruption. Demonstrations continue to ebb and flow. Their complaints don’t target specific political factions, but the Iranian governmental in general. Traditional buyers of Iranian oil—including South Korea, India, and members states of the European Union—are likely to scale down their imports under Trump’s threats of sanctioning any country that does business with Iran. During the 2012 multilateral sanctions, China was pressured to reduce its Iranian oil exports. As one of the remaining signatories of the JCPOA, Beijing wants to keep the deal alive, and thus will ignore the US this time around. China also doesn’t have the same qualms as other Asian countries since Beijing is already embroiled in a trade war with Washington, with no end in sight. The exit of other nations from Iran, even if only in part, opens the field for Chinese President Xi Jinping to expand his Belt and Road Initiative as well. The Chabahar Port, Iran’s only oceanic port, is partially operated by India Ports Global, and New Delhi has poured significant resources into developing the infrastructure of Chabahar, including a recent $500 million investment to build two berths. But things may change once US sanctions targeting oil, ports, and shipping kick in on November 5. If India doesn’t manage to secure a waiver from the Trump administration for Chabahar, it’s likely that the country will scale down its oil imports from Iran. Rumors are already surfacing that New Delhi has reduced its oil imports to zero for the month of November. And Iran has already indicated that it would like to involve China in the port if India pulls out of future developments. Taking over part of the port’s operation would be of strategic interest to China, as it has already done so in other countries, such as Sri Lanka and Pakistan. It’s clear that Beijing’s way of doing business appeals to the Iranian government. When France’s Total recused itself from Iran by abandoning a contract to develop a new phase of the South Pars gas project, Iranian oil minister Bijan Zanganeh said, “The process to replace [Total] with another company is underway.” The state-owned China National Petroleum Corporation (CNPC) was floated by Iranian officials as Total’s replacement, potentially taking an 80 percent stake in the deal. Even when South Korea, India, and European nations have significantly cut back on purchasing Iran’s oil in the past months, China’s share has remained relatively constant since the beginning of the year. Increased oil exports to China will be a boon for Iran, as demand for the commodity has tapered off, leading to tankers loaded with oil left floating in neutral waters, awaiting buyers. Washington recognizes the importance of oil exports to Iran, and it is no secret that the aim to bring those exports down to zero by November is part of the larger plan of forcing Tehran to yield and accept renegotiations of a new deal that would curb its ballistic and nuclear program as well as its regional role. 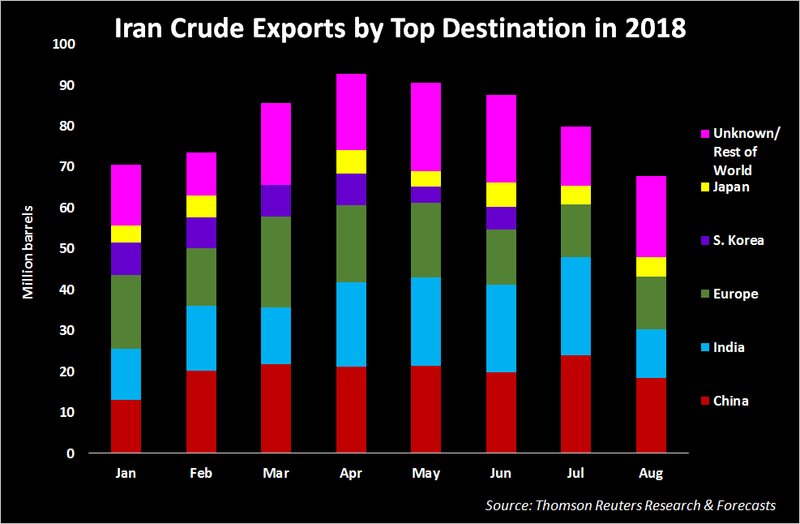 But consider that, as Reuters reported in August, Chinese refiners have allowed the usage of Iranian tankers to deliver crude. This means that Iranian corporations will be covering the costs of doing business with China and providing insurance for the shipments, thus bypassing Washington’s sanctions. However, it remains unclear how exactly Iranian entities will provide insurance for the Chinese oil purchases, which are worth $1.5 billion per month. To further insulate the Iran-China oil trade from foreign entities, CNPC has its own bank, the Bank of Kunlun, which has limited exposure to the global financial system. The Central Bank of Iran has accounts at the Bank of Kunlun, where Chinese buyers of Iranian oil have deposited billions of dollars before, prior to the existence of the JCPOA. This is all to say that Iran faces a political bind but will weather that storm, because Tehran has a sufficiently powerful and influential backer—in this case, China—as long as the oil keeps flowing. We’ve seen the same happen with North Korea, where Beijing was willing to support an unpopular regime, reaping benefits along the way. If the relationship between Iran and China is not severed, US sanctions on the Tehran will never be fully effective, and the Trump administration’s dream of forcing a new deal will never come to fruition. Brendon Hong is the pen name of a writer based in China. He has written for the Daily Beast and Vice. Follow him on Twitter: @realbluechina.